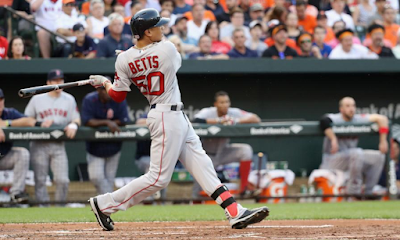 Outfielder Mookie Betts will make his first All-Star appearance next Tuesday. The Red Sox’s offense, which has added two-time Silver Slugger Aaron Hill, was very good over the last week, as quite a few players put up OPS’s above 1.000. They scored double digit runs in three of their last four games, and moved to 11-0 when scoring at least 10 runs this season. Although the pitching has not been very consistent, eight Red Sox had hits and runs in Wednesday’s rubber match victory against Texas. All stats as of July 8th. 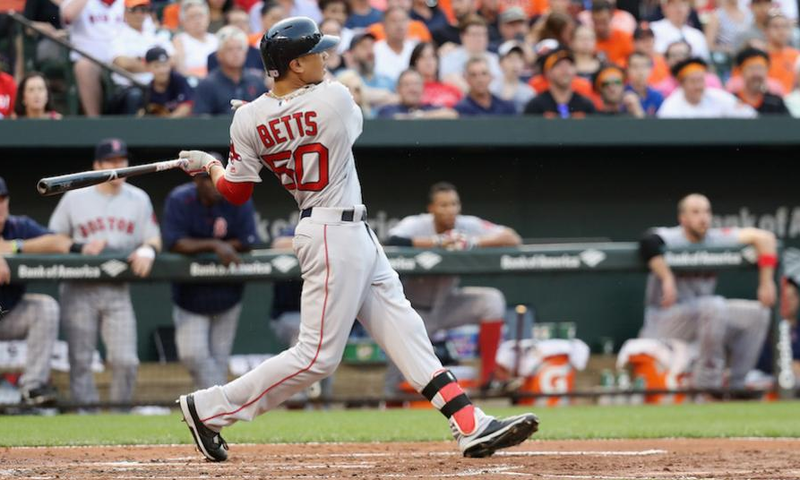 RF Mookie Betts, a first-time All-Star in 2016, extended his hitting streak to eight games on Wednesday and has 13 hits in 29 July at bats. 2B Dustin Pedroia is in the final vote (yes, of course, #VotePedey), but Wednesday’s game was a difficult one for him (0-for-4 and a fielding error). Thursday is an off day for Boston, so the less exposure looks to prevent him from having a chance in the final vote. It does not look like he will be in his fifth All-Star Game, but he is healthy, and he had a 10-game hitting streak before Wednesday. #RestUpPedey – it is a long season. SS Xander Bogaerts, another first-time All-Star in 2016, started July with a couple 0-fer games, but he has reached base in 18 straight contests. DH David Ortiz is showing no signs of slowing down, as he launched his 20th home run of the season on Wednesday. With his 15th consecutive year of at least 20 home runs, the now 10-time All-Star has tied for the third-longest streak of hitting at least 20 home runs in MLB history. 1B Hanley Ramirez did not hit any home runs over the last week, but he sure got on base. On Wednesday, he already hit his sixth double of July. In the month, he has a slash line of .529/.652/.882. CF Jackie Bradley Jr., yet another a first-time All-Star in 2016, already owns career highs in runs scored, hits, doubles, triples, home runs, runs batted in and walks. His strikeout-filled June was his worst month of 2016, but July has started well for the 26-year-old. LF Bryce Brentz drove in a career-best three runs in his 17th MLB game on Wednesday. Brentz had not played since July 2, but he looks like he will produce as a backup. 3B/1B Travis Shaw had difficulty getting on base in June, but he already has seven hits in five games in July. Fortunately for Shaw, his x-rays were negative after fouling a ball off of his foot on Wednesday. C Ryan Hanigan took advantage of the Rangers’ errors in the second inning of Wednesday’s contest, as he hit a two-run single in his first plate appearance in over a month. It was his only hit of the night, but the Red Sox moved to 17-6 in games he has played in this season. BN/C Sandy Leon did not play on Wednesday, but did so on each of the previous three days. He had hits in each of those starts, as his bat continues to stay hot. In July 4’s 12-5 victory, he had three doubles. LF Brock Holt, whom the Red Sox activated from the disabled list on July 1, left Friday night's game with a sprained ankle. Before that, Holt had six hits in four games this month. He recently joked about being the only Red Sox player not being on the 2016 All-Star team after being the lone Red Sox representative in 2015. Assuming his ankle injury isn't serious, Holt could be set to make a 2015-like impact on Boston in the second half of the season. 3B/2B Marco Hernandez has two hits in each of his two starts in July. He is producing at the bottom of the order and should keep a roster spot as long as he keeps hitting. For more sports coverage, follow Adam Lowenstein on Twitter at @StatsAdam. Statistics used from Baseball-Reference.com.